What a wonderful gift Roland Evans has offered us. In this book he casts his net wide and pulls in many stars. He dares to ask the “big questions” of life, concerns that we ponder at 3 a.m., in times of turbulent transition or quiet repose, questions like: What kind of life is worth living? Why am I suffering, and what should I do? How do I know what is the right decision? 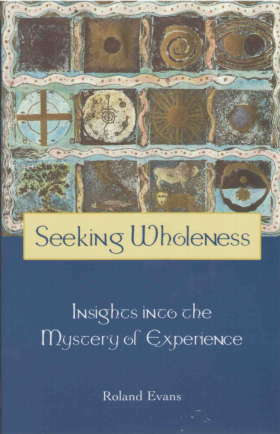 In Seeking Wholeness, Roland gives us a guide for living. He challenges us to see in fresh ways. We might call it process psychology, a set of tools for approaching experience as a moving, ever-changing flow, a movie rather than a series of still photos. This way of understanding life as a flowing, interconnected system is part of a new paradigm that has emerged in many different disciplines — physics, biology, ecology, economics, philosophy, even organizational management. While Roland’s work is brimming with ideas, it also remains open to mystery, wonder, and awe. At its core Seeking Wholeness is guided by and infused with an intense spirituality. This is psychology that fully embraces the depth of psyche and does not artificially cordon itself off from cosmological concerns. By showing us practical strategies for bringing the sacred into daily life, it provides rich food for the heart and the soul. You don’t need to be in the helping professions to understand and benefit from this book — anyone interested in cultivating inner growth and integrity will benefit from the stories and exercises contained within.